My New Kids' Book--Rinku & the Silver Wings! Hello on a frigid Midwestern day! It always amazes me though, that no matter how cold it is (it was 2 degrees F earlier) that radiation from the sun—93,000,000 miles away!— still melts icicles…I’ve always loved the winter landscape. I feel that through their lithe, sinuous limbs, the bare trees are striving to tell us something…if only we made time to be still and listen…Naturally, trees figure prominently in Rinku, which is set in the world of birds. The winged (and winged-yet-still-flightless) beings decide— since humans aren’t doing anything about cleaning up the earth— they will take up the challenge and take back their planet! Please have a look; click on Rinku. And here’s my YouTube channel. In addition to clips of me reading from my work, you can also see clips from other Dances of India productions, which I wrote and narrated. Our 2018 production was entitled The Tale of Urmila, the Sleeping Princess. It gave voice to one of the least-known characters in the Hindu epic The Ramayana, who sacrifices 14 years of her life for her husband, sister Sita, and Sita’s husband Prince Rama. Lastly, I’m delighted to mention that a couple of my essays will be published in the St. Louis Anthology, a collection of essays on the Lou to be put out by Belt Press in June 2019. Please click on St. Louis Anthology to have a look! 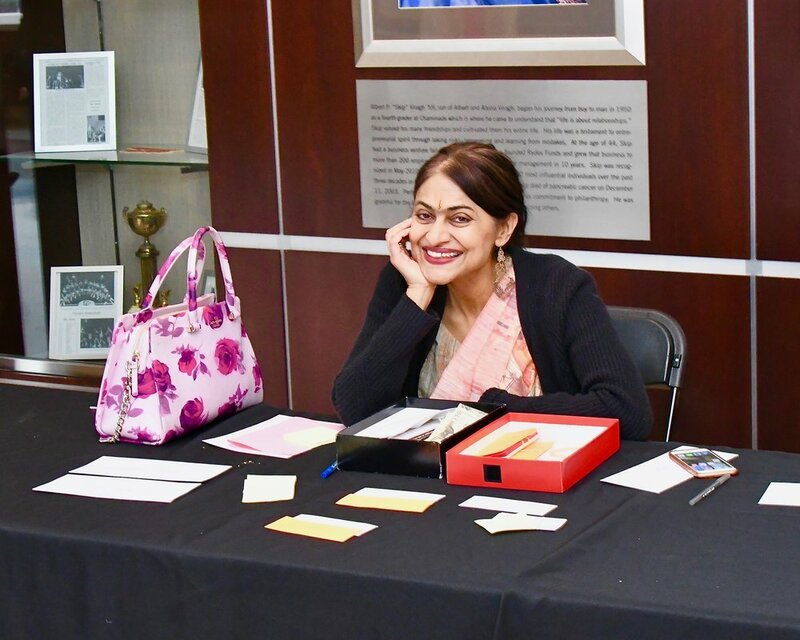 At the ticket desk at our 42nd Annual Performance Sunday Matinee, November 2019. My dad manned this desk for 37 years! New Writing! Well, Actually Kind of Old That's Once Again New...Rinku & the Silver Wings. …much as the swans fly onto the Vltava River in Prague…here is a photo from that most enchanting and dreamlike of cities from summer 2018…. Here are a couple of clips from my talk: the first is on ahimsa, or nonviolence, and the following is on the nature of commitment to your ideals. Hello there! I'm delighted to announce I'll be giving a talk entitled: Full Effort is Full Victory; Gandhi, King, and the Path of Persistent Peace at Florissant Valley Community College on February 28 and at the Ethical Society on March 25. New! Published Piece in Panorama, The Journal of Intelligent Travel, and Invitation to Speak at the Missouri History Museum. The day we had to sell my dad's beautiful 2010 Cadillac DTS....it's the subject (well, one of the subjects) of my piece in Panorama, Dr. Premachandra's Pilgrimage. I am ALSO delighted to announce that the Missouri History Museum has asked me to speak about Mohandas Gandhi and his influence on Dr. Martin Luther King for Martin Luther King Day in January 2018. Details will be forthcoming soon. Please come and join me! On a recent trip to France; this is taken in the Jardin du Luxembourg in Paris where I spent hours as a student, studying, reading long letters from family, friends, my pen-pal....and writing long letters back, of course. France was the first country in which I lived on my own; I'm so glad I did it without email and smartphones! Well it's our 40th season! My mom and dad started the company in 1976, and put on their first show in 1977. Never in their wildest dreams could they have imagined the company would keep going for 40 years. My parents named the company, Dances of India--a very simple, clear name--because up until the 1990's, if you said you were Indian, people here always, but always, thought you meant "Native American." We'd always hear responses along the lines of, "Indian! I'm a quarter Cherokee myself!" Or, "My grandmother's Cherokee!" Or, my absolute favorite response, which I've retold dozens of times, "Indian? I played bingo once on a reservation in Oklahoma!" In addition to dancing I write and narrate our performances. We always give...unexpected spins to our stories. I was born in St. Louis, Missouri, which is certainly a home, but India is as well a home. The picture on my right is from Bhoganandeswara Temple, an exquisite 8th-century temple near Bangalore. And in addition to India, France has always been a home. I lived there for a while, as I began studying French at age 12 and kept going all the way through university. Versailles. The palace is overrated, but the gardens...haven't the words. I walked upon your shores for one week, no more, breathing in your green melodies (such a harmonic range of green, each tone a meticulously crafted capture of rain-spun air), stepping upon earth soaked with the same water that sails through the vessels hidden just beneath my skin, believing in the fairies that inhabit small apartments of bark in fairy-tale old oaks, accessible only through tiny brightly-painted doors. Yet my stay upon your island feels much longer than seven days; time is a long-standing song that fades away in the reality of the present, and will then suddenly reappear to declare, I am here. And yet I know there is no time. What else have you shown me Ireland, as I wandered through the grounds of a sixth-century monastery, and then embraced an eight-century Celtic cross? What is time—much less space--when I am only seconds away from being swept into harrowingly hungry wind that will never long to know my name, its only true desire to show me my jeweled insignificance? You have also shown me this: the only language worth learning is spoken in water. The only runes worth studying are those carved of rain. Seventy percent of my being is water, and what else but fog---the steady dance of condensed water-drops---can make the grand Atlantic, disappear? Much like my father, lost behind the veil separating worlds. But oh, how I felt him in your songs, Ireland, in your determination to drench the world in ephemeral, fluid, music—the rhythmically beating heart, of joy. And so, Ireland, you have not simply asked me to dream, not simply reminded me to dream, but indeed have demanded me to dream. In the fragile space of seven days I have seen so many astonishingly beautiful births, of the earth: a vibrant horse with a heavenly mane, a swan bearing a silvery name—she was so majestic I know she was the vehicle of Saraswati, the gently wise, wildly intelligent Hindu goddess of creativity. And the earth laughs as well----oh, how she laughs--through miniature horses, irritable ponies, the intense focus of a border collie, on duty. And then there are the hooting owls, hundreds of cows, so many sheep I must be asleep---but indeed I am not lost in a dream, but rather am completely, daringly, awake. As you must know, only someone who has mastered suffering can command another to dream—for a master by definition is resilient. And you are resilient, Ireland, after years and years of suffering—winds lash you and storms love you because you simply will not give in, nor give up. Your rivers flow black during gales, as black as the ink upon old texts, upon tossed-away sheets of creators refusing to stop creating. My only difference with you, Ireland? I hardly take alcohol. My only drink is mixed of the thoughts created, then released, by ink. You should understand—your entire island, is a scriptorium. After writing this I realized I didn't mention any Irish people! I actually didn't meet very many, as I was on a tour. But the ones I met were mostly grand (an Irish expression I love!) --a particularly proud-of-his-city Dublin cabbie named Roderick especially stands out in my mind. Welcome to the Official Launch of my Website! Hi there! It's the 18th of January 2016 and I just put up a new updated excerpt of my most recent novel, The Palace of the Seven Stories. It's a whimsical, philosophical, tale, where a 12-year old French-Afghani girl and a 12-year old American boy find themselves in an adventure where they have to bring an end to Kaliyuga, the age of discord and strife in which we find ourselves. Other characters include a French archaeologist, Buddhist historian, quantum physicist, and philosophical terrier named Jacques. Oh--there are also historical Chinese Buddhist monks (Fa Hsien & Hsuan Tsang, for those of you interested in these incredible men who walked their way from China to India in the 5th & 7th centuries A.D.) a French concierge and her monstrous cat, a sarcastic contemporary young Chinese-French Buddhist monk, three Hindu goddesses who have incarnated into some drop-dead gorgeous brilliant ladies... Please click above! I will add more of my other work soon. Hi everyone! Well, I am officially launching my website today, December 20th, 2015--exactly one year since the death of my father. As you will see in the page Poems on Loss & Magic, 2014 was a year of almost incessant loss for me---family friends and relatives passed, and then in swift, unexpected order, my grandmother, my dad, and a beloved professor of mine. I have been writing for years, and dancing--classical & folk dances of India--since the age of 5. I was born in St. Louis, Missouri, and grew up at a time when being "Indian" meant being "Cherokee" as in, "You're Indian, really? I'm a quarter Cherokee!" We heard that for years, up until the software boom of the mid-'90's, when Indians started arriving in St. Louis in greater numbers. Please click on About to learn more about me. I love reading about physics---no matter how much I read, there is so much more to read, because no matter how much I understand about the universe (which is so incredibly little! ), there is so much more to understand. I am fascinated by science---so much intrigues me, from the microbes in our cells to the incomprehensibly ancient rocks of this earth, to, of course, the chimerical, magical, dancing cataracts of light which color each and every one of our days. I am also fascinated by art---where do I begin? Music enchants me--from ancient Sanskrit slokas, to Rimsky-Korsikov's Scheherazade and Gershwin's gorgeous Rhapsody in Blue (among many, many, other classical pieces), the intoxicating beats of quawwali, bhangra, classical Carnatic rhythms which are as familiar to me as water. (And, as I have discovered when I lived away from home, as necessary). Of course there is also homegrown jazz, bossa nova, flamenco....and then there is painting from around the world, whether Odilon Redon, the pre-Raphaelites (whom I just adore), absolutely dreamy Japanese prints...literature...too many books to mention right here, I will create a separate page for that in a little while...sculpture...Rodin's creations, the phenomenal statue of Nataraja ---Shiva as the dancing deity par excellence--which never fails to elicit within me pure awe at the pristine uncontrollable power of his dance---(and to think, we will never know the names of the anonymous sculptors who rendered this dance into a figure which still staggers us with its dynamic movement thousands of years after its creation--)...poetry...from Rilke to e.e. cummings (whose somewhere i have never traveled is the more gorgeous love-poem in the world, I think) to the exquisite writings of local poet Marjorie Stelmach (from whom I was fortunate enough to learn writing in junior high and high school). This world is an absolute wonder!!! And that is what I write about. Please, enjoy, I appreciate any feedback at all.